After more than two decades, the unstoppable Bill Warner and his minion of magicians continue to outdo themselves year after year. Maureen & Mike Matune were on the show field representing CGC. And this is what it all comes down to: the Best in Show presentation. How the judges are able to distill a field of automotive jewelry into two choices is awe-inspiring. 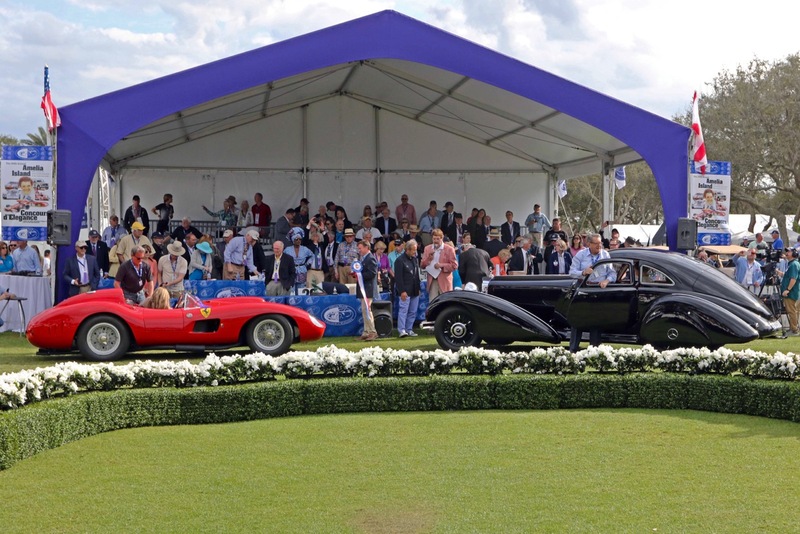 Taking home the Ritz-Carlton trophies this year were the ‘57 Ferrari 335 S of Cavallino Investments and the ‘35 Mercedes 540K Autobahn-kurier from the Keller Collection at the Pyramids. 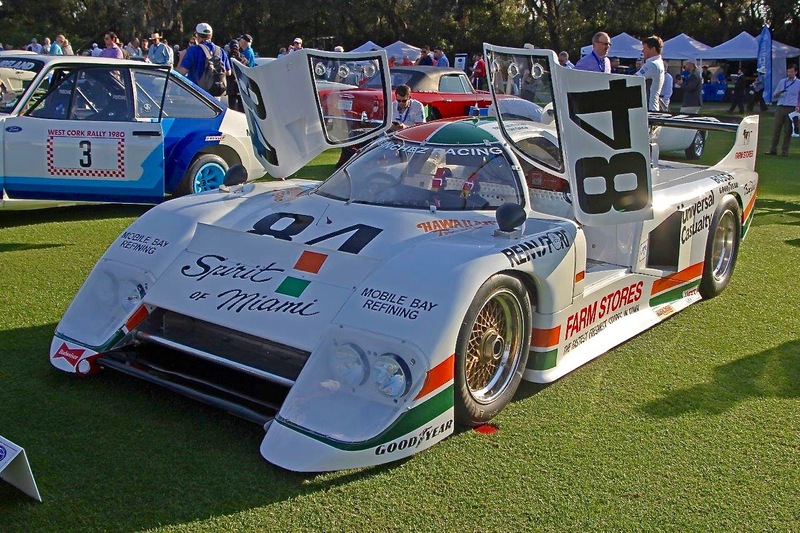 As in each year past, Amelia Island recognized an individual’s motorsport contributions. This year it was Jacky Ickx. His versatile resume holds numerous endurance race victories, including six at Le Mans, along with multiple F1 victories, a Can Am title and a class victory in the Paris-Dakar Rally. 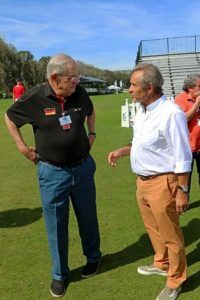 We show him here with Bill Warner, Amelia Island Concours Founder & Chairman, left. Score one for the home team. 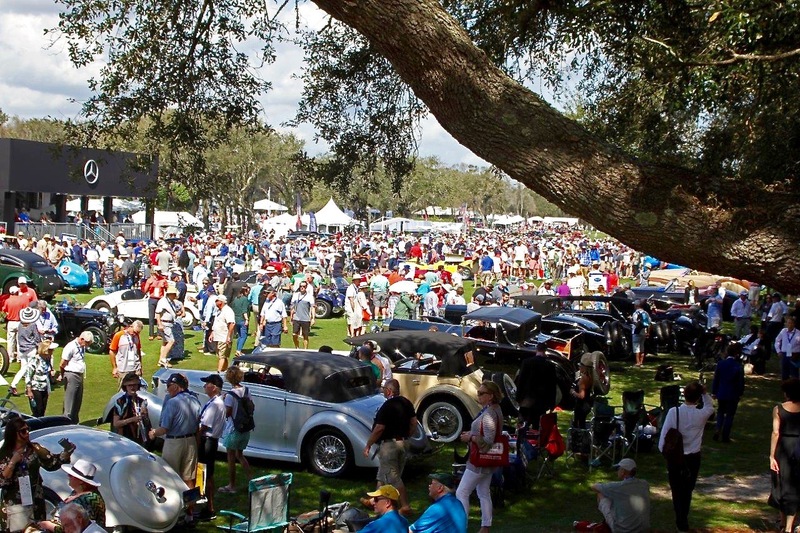 After being forced to move the last two Amelia Island Concours d’Elegance (AICE) to Saturday based on weather, the gods smiled broadly this year and graced The 24th Concours with the best weather the Sunshine State could deliver. The crowds responded and throngs of spectators enjoyed a myriad of automotive delights. John Oates is perhaps best known as half of the legendary duo Hall and Oates, whose music has topped charts worldwide. But at this year’s AICE he showed another side, that of serious car collector. Here he is with his ‘60 Porsche 356 Emory Special. In the ever-burgeoning world of 356 Outlaws, this one stands out because of flawless design and impeccable workmanship. Judges agreed and awarded him Best in Class for Cars of the Rock Stars. The Heads of State class was sub-titled The Cars of Kings and Queens, Presidents, Popes and a Dictator. Each car had a unique history to complement its impressive road presence. Such is the case with Nicola Bulgari’s (The NB Collection) ‘38 Cadillac V16 Limousine Town Car that made its American debut at the AICE. Originally the property of an Italian Countess, the car passed to Cardinal Francis Spellman upon her passing. He placed it in the Vatican Motor Pool where it saw use by church dignitaries including Pope Pius XII. Here it is on its way to receive an Amelia Award. 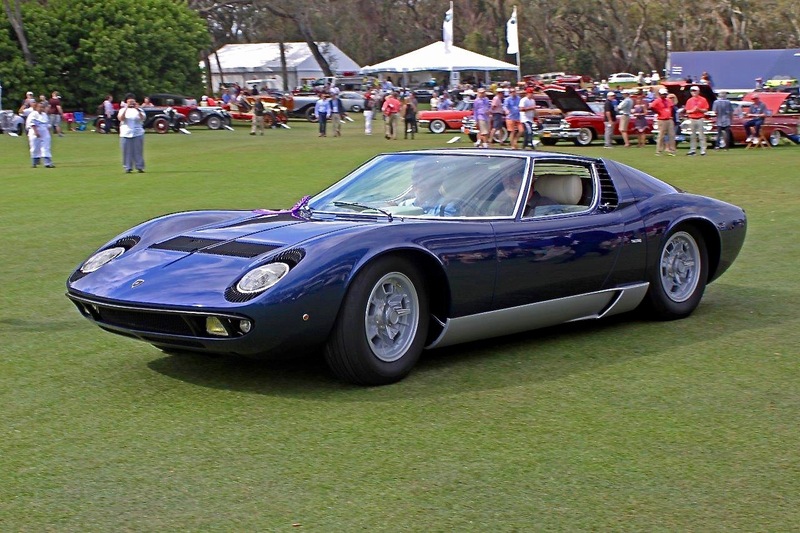 When viewing a Lamborghini Miura, you want to comment about how well the design has aged. But looking at it another way, it hasn’t aged; it is as fresh and as impressive as it has always been. 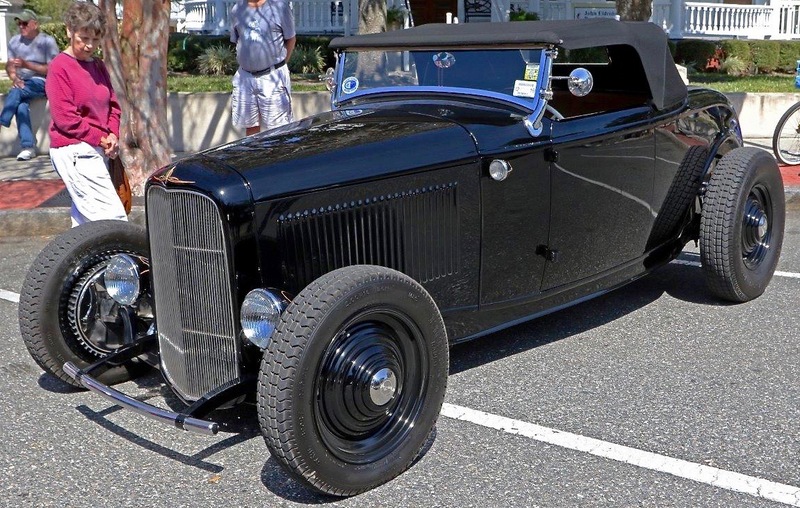 The Kurtz Brothers own this example that took home The Craftsman Phil Hill Restorers Award-Sports/Race. 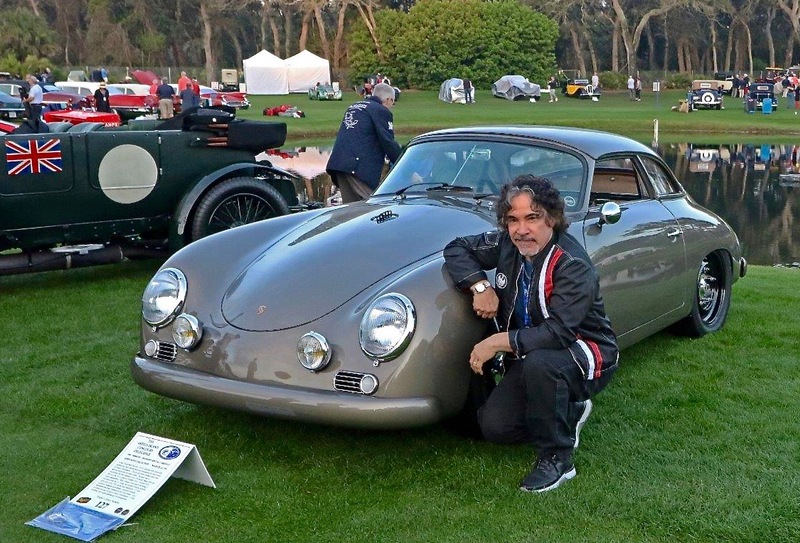 John Oates curated the Cars of the Rock Stars Class. These displays paired guitars with vehicles associated with rock icons. Christian Zugel’s ‘57 Porsche AP 18 was raced by Oates at Rennsport. It proudly wears the colors of Porsche’s “Flying Pig” 917 from the 1971 Le Mans 24-Hour. 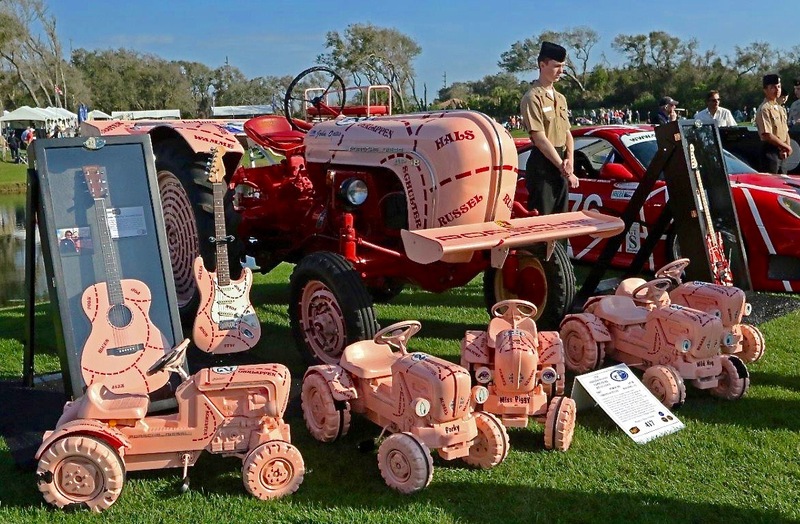 “Piglets” and a Martin “Pink Pig” Acoustic Guitar from the John Oates Collection complement the display. It wears the same livery with the cuts of meat from the original livery renamed into musical genres! 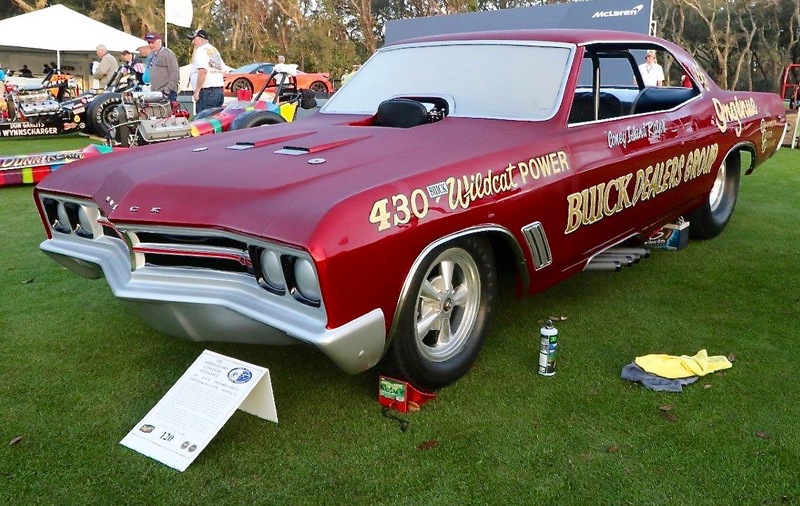 Raina & John Lipori’s ‘67 Buick Skylark GS400 Funny Car is a great example of the kind of innovation that permeated the early Funny Car ranks. It used a nitro-burning, blown, injected Buick, hardly a common sight at drag strips. It ran out of Brooklyn Speed and Marine sponsored by the Ingenue Buick Dealers Group, comprised of Buick dealers in the NYC area. It shares the use of a fiberglass replica body and tube frame with modern Funny Cars, but unlike them, uses a production based transmission and sprung rear axle. 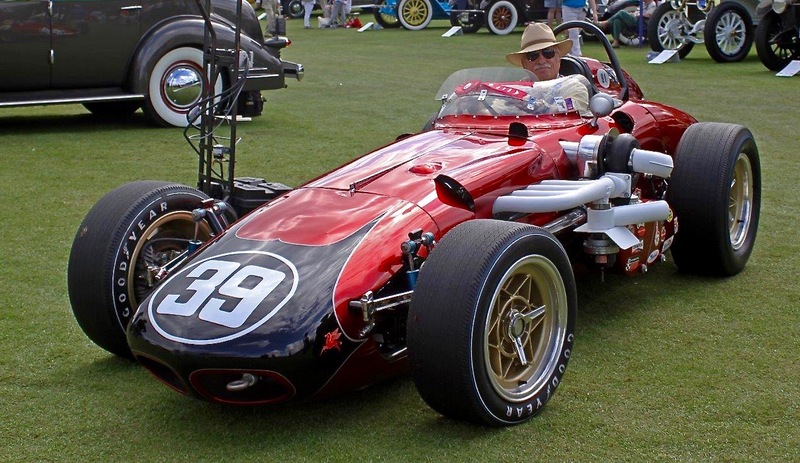 This Indy Roadster holds the honor of being the last roadster to compete there in 1966 driven by Bobby Grim. By this time, the roadster had evolved using wide, low profile tires and a turbocharged Offy. Grim would start on the inside of the last row against 32 rear-engined machines. The roadster’s last hurrah ended up ingloriously in a first lap melee. He would not be credited with turning a single race lap. Today the car has been lovingly restored and is owned by Diane & Bob McConnell. One POSIES creation is usually enough to take in at once, a whole row of them; well that’s just overload! Here is one of his earlier efforts from 1997, Phunkie ‘32. Nothing dates to 1932, except the car’s whole vibe. As with any truly distinctive car, details abound like subtle pin striping, custom taillight lenses, and a gas filler door set into the body. And it is no trailer-queen, having completed the Hot Rod Power Tour and other long-distance events. 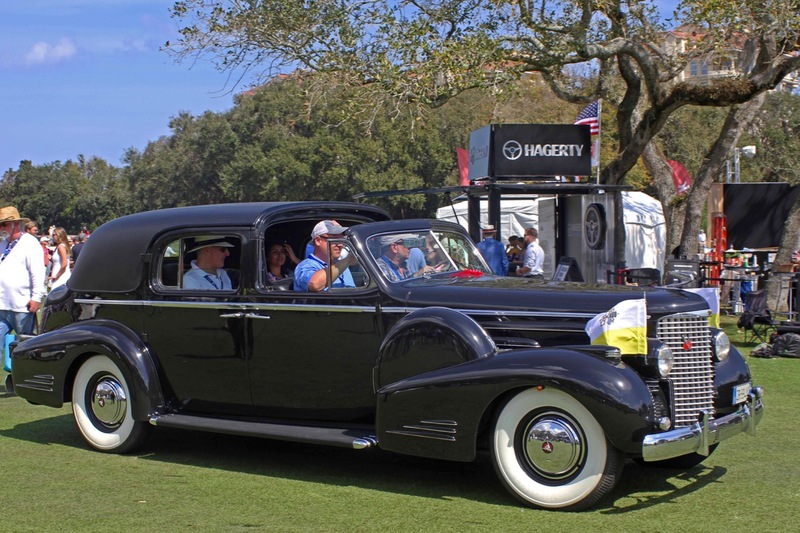 Photographed during Friday’s Reliable Carriers Eight Flags Road Tour where Concours participants used their pristine cars as originally intended – they’re driven! Lisa & Dan Johnson have the honor of calling it theirs. In the early 1970s GM was fascinated with the Wankel Rotary engine and is said to have had plans to use them throughout their lineup. To showcase the engine, they produced this Corvette prototype, the XP-897 GT. 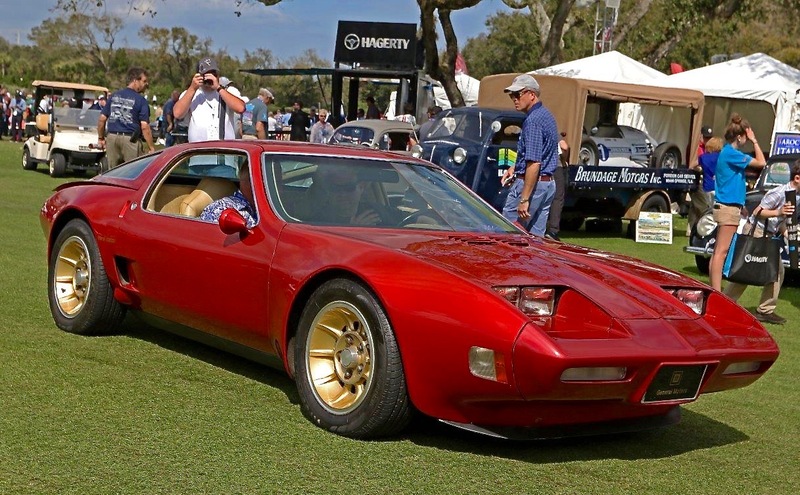 In addition to its choice of powerplant, GM placed that engine amidships, another tease at a mid-engine Corvette. Alas, it was not to be, as issues with durability, fuel consumption and pollution combined to kill the project. After time on the show circuit it ended up in at GM in the UK, allegedly to avoid paying Customs Duties. Here owner Tom Falconer drives to the awards stage proving how far along the Concept was. 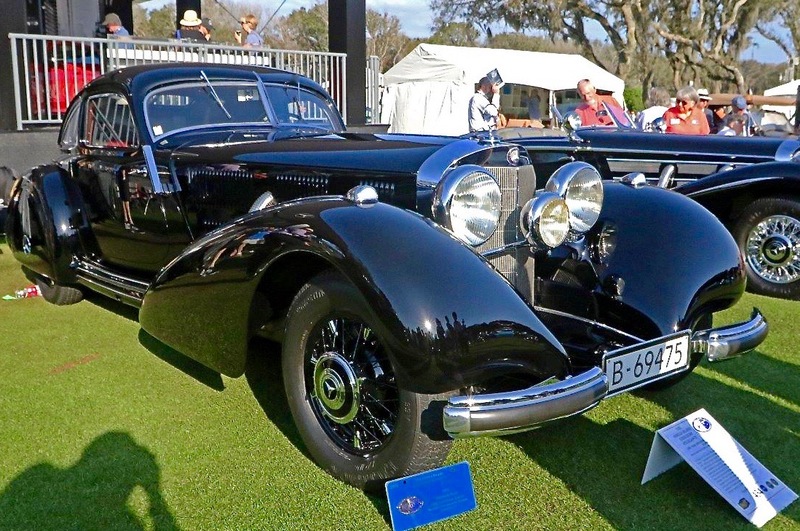 The Mercedes Benz 540K was a “Supercar” before the term was coined! Representing the pinnacle of speed and grace at the time, they were aimed at a limited audience who would appreciate its powerful nature. This one is an Autobahnen Kurierwagen that could very roughly translate to Autobahn Cruiser. In its literature, Mercedes gave it sole purpose as crossing miles of open road at very high speeds. The Keller Collection at the Pyramids would leave AICE a multiple winner. Like all racecars, Ferraris evolved over time. The SWB or Short Wheel Base, stands between the successful TdF (Tour d’France) cars and the hugely successful, legendary GTO. Celebrating 60 years since its introduction at the 1959 Paris Auto Show, the SWB holds a place of honor in Ferrari’s racing lineage. Among the SWBs displayed was the ‘61 Ferrari 250GT SWB Speciale of Scuderia N.E. 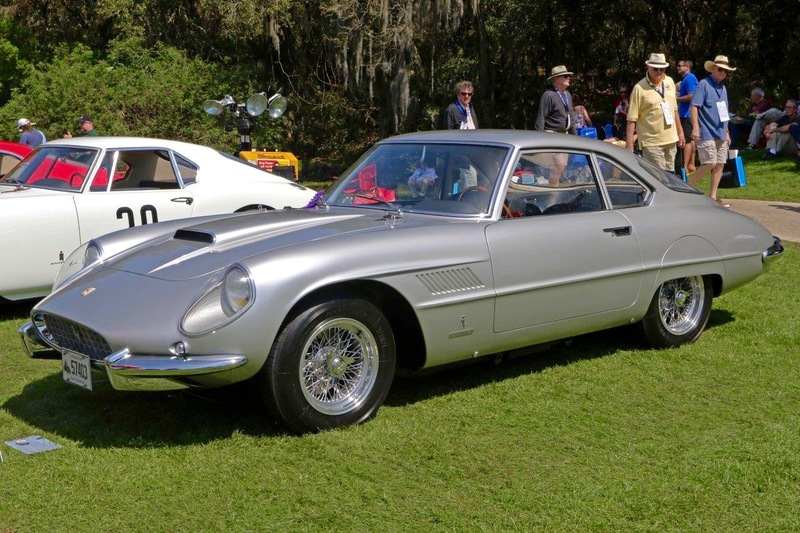 Built by Pininfarina for a French customer; it features aluminum bodywork over full-race underpinnings. Never raced, it instead gave its owners a very fast ride! Borla Performance Industries presented something of a unique award, “Best Sound on the Field”. Normally Concours awards are confined to recognizing visual excellence. Borla thought we should recognize that one takes in a car with all of one’s senses, including hearing. This year’s winner was Suzanne & John Campion’s ‘83 March 83G. Not only a winning racecar with striking visuals, the exhaust note of its 366-inch, fuel injected Chevy caught the judges attention. Words & Photos: Maureen & Mike Matune. Our thanks to Bill Warner, his staff, and a legion of volunteers for their efforts. Additionally, thanks to Chris Brewer for his help with credentials and for keeping us updated on Concours happenings. Lastly thanks to Infiniti for sponsoring the Media Center each year, it was truly an oasis when one was needed.